This cute yellow boat is preparing to cast off on an adventure. Looking at this print takes me back to my day spent on the tropical waters near the little village of Celestún on the Yucatan coast of the Gulf of Mexico. The water, as you can see, was just gorgeous. There’s just something about the sea in general, that I find calming, and I bet there are a lot more like me out there. Does the ocean speak to you on some metaphysical level too? So, in a way this cute little yellow boat is a metaphor. 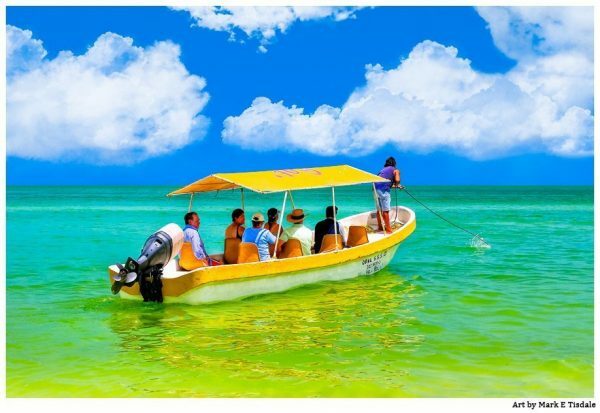 It transports me from the dull beat of everyday life to my personal happy place where the skies are bright blue, the water is sea-green, and the boats are painted tropical colors. Does that sound anything like your happy place, too? Every since that lone day spent on that tropical beach, I’ve wanted to go back. I could imagine spending weeks easily roaming the shore there and basking in the warm sun. And most of all I would love more of the artistic inspiration I got from that first trip there. Does this tropical art print remind you of your own personal happy place? Or maybe you’ve also visited Celestún? I would love it if you took a moment to share what speaks to you most about this little yellow boat print!